Made with high-quality, food-safe material, BPA, PVC & phthalate free. What are Fun Feeders made of? 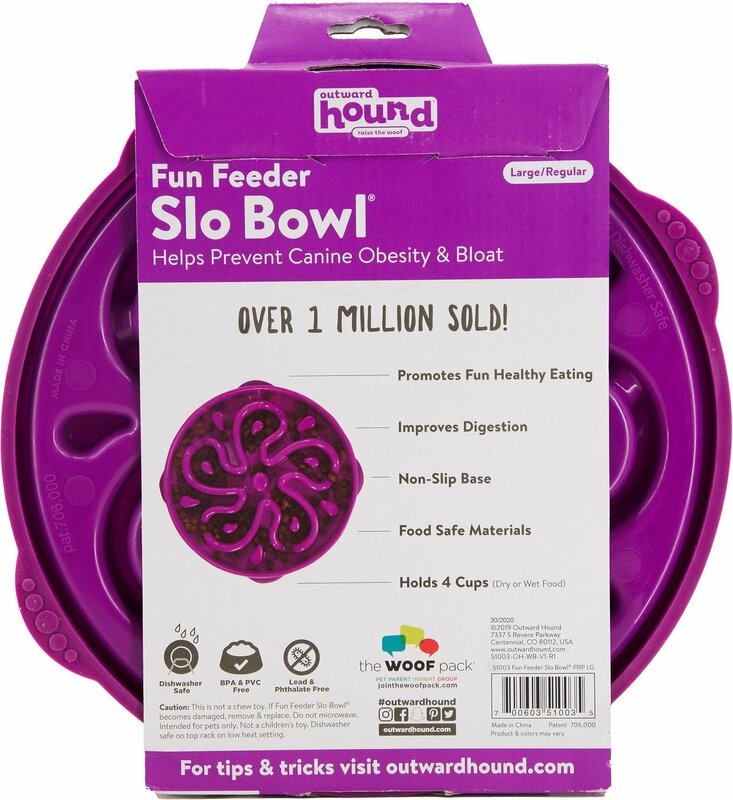 Fun Feeders are made with food-grade plastic that is BPA, PVC, lead and phthalate free. I bought 2 of these interactive bowls. Our Boder-Collie/Boxer mix, Grey loves it! He used to eat his dry food in big gulps in about 2 minutes. This feeder has slowed him down and it now takes him about 10 minutes. Our 13yo puggle Krypto, doesn’t need it much these days. So we have an extra one for when G is older. 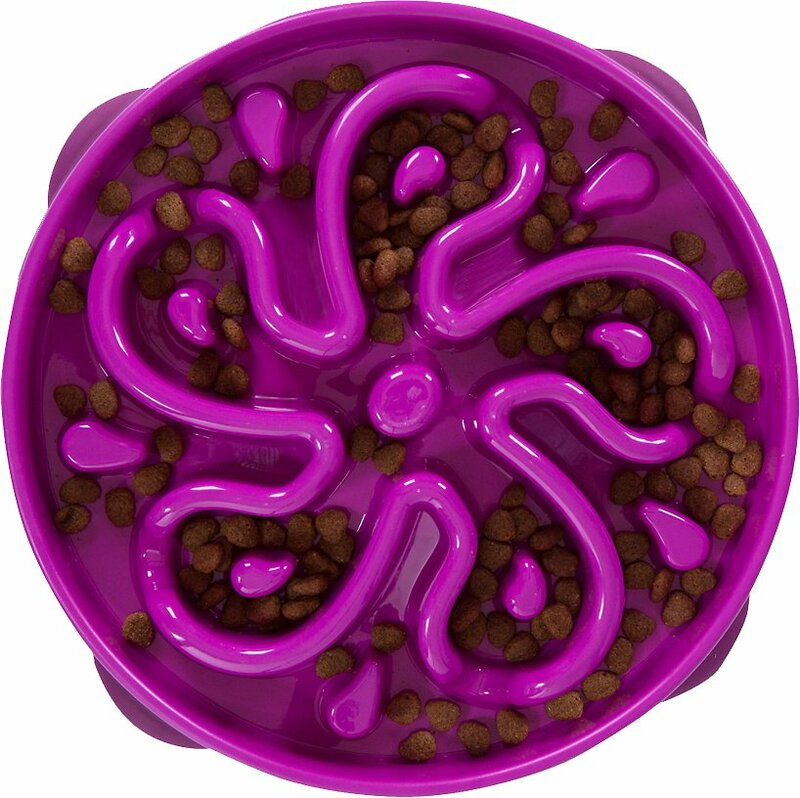 The ONLY downfall I see is this, when he is done eating, he will flip the bowl over and chew on the bottom tabs. It’s durable enough that it hasn’t become an issue. Other then that, I would 100% recommend this feeder. 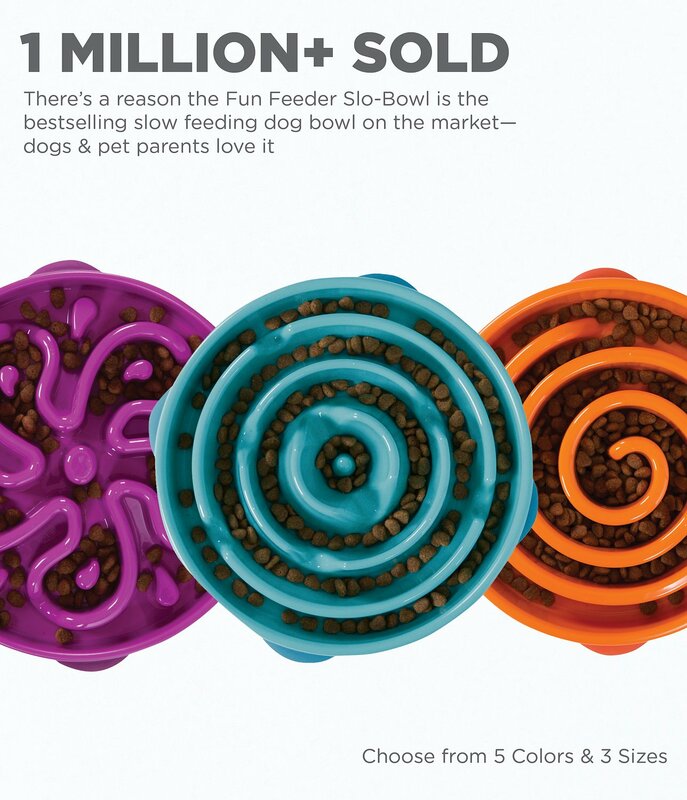 This is a great option for any paw-rents like me whose puppies love to inhale their food in 30 seconds flat. 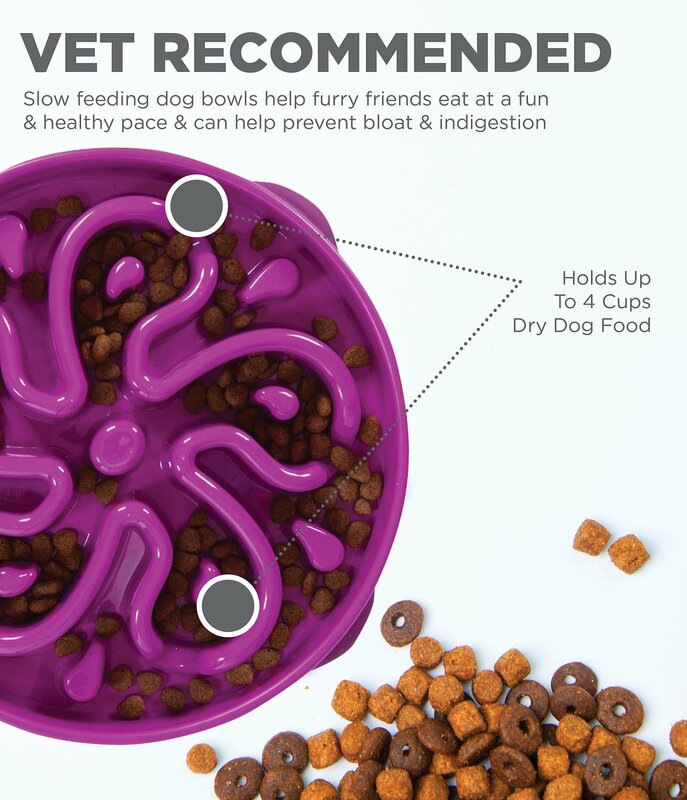 Now, mealtimes take several minutes, and I don't have to worry that all of that kibble is going to come right back up in the form of undigested vomit. Our four-month old was able to figure this out pretty quickly, although it takes him a few minutes to get the last dozen or so pieces of kibble. 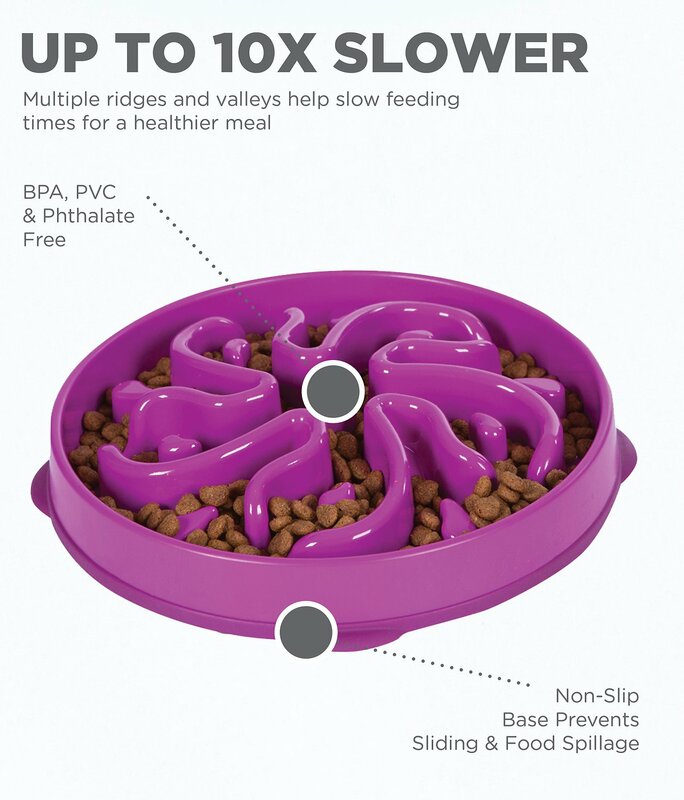 My Pomeranian was inhaling her food out of the blue and started throwing up every day and I tried EVERYTHING to get her to stop and nothing worked so I decided to try a slow feeder and this did just the trick! At first she was a bit annoyed with it but after awhile she actually really enjoyed it. My puppy even was curious and wanted to eat out of it! I only gave 4 stars because it is pretty tore up after a few months of use due to biting and gnawing trying to get the food out. I would still buy this again! My lab puppy, who is now five months old, could consume a cup of dry dog food in 60 seconds. Which resulted in gas, bloating and runny stools. He would do his business in about five minutes after eating . Now with this new feeding bowl it takes him about 8 minutes to eat. The funny thing is though he circles his bowl while he’s eating, it’s like watching a dog on a merry-go-round. Happy I bought it it really solves the problem of him gulping his food. This has worked well for my lab after only a few feedings, but I noticed it didn't slow him down much. After reading Q&As after the fact, I learned that orange is the "hardest" of the three colors. However, I would say this has really piqued his interest in mealtime again and he enjoys the challenge. I plan to get an orange one as well and alternate them so one can be filled with frozen treats for when I'm out of the house. REALLY Slows Down Fast Eater! 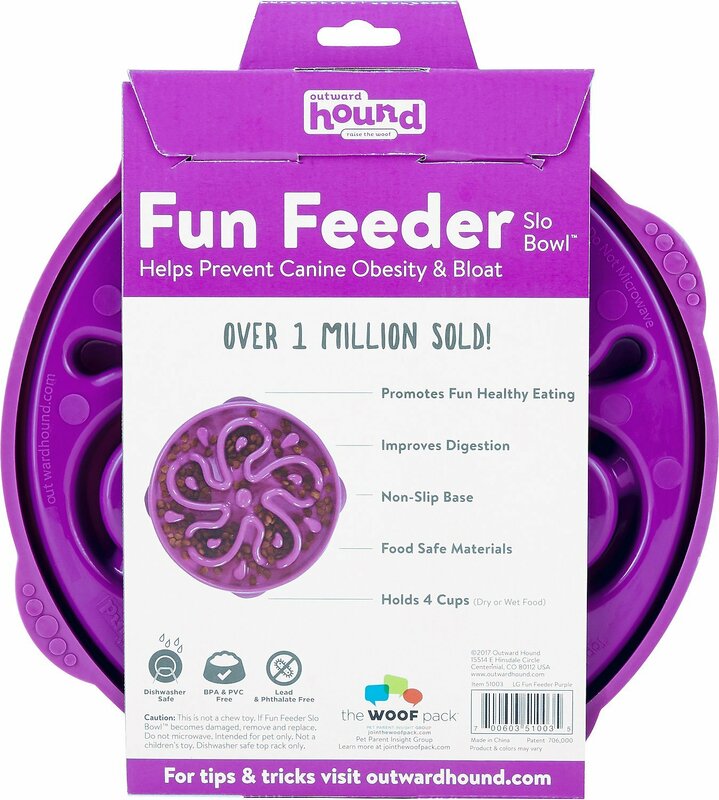 One of our three dogs, border/aussie Teddy, sucked in his food so fast, a whole regular bowl within a few minutes and that is NOT healthy eating. I tried one of those bowls that has just one large bump in the middle, but that didn't slow him down enough. THIS bowl does the trick! Teddy still tries to gobble all the food fast, but he can't and while he still finishes his food a bit faster than the other two dogs, his eating habits have improved. His tail is always wagging while he eats! This is one of the most entertaining experiences of my life. Our beagle mix inhales his food like he’s been starved. 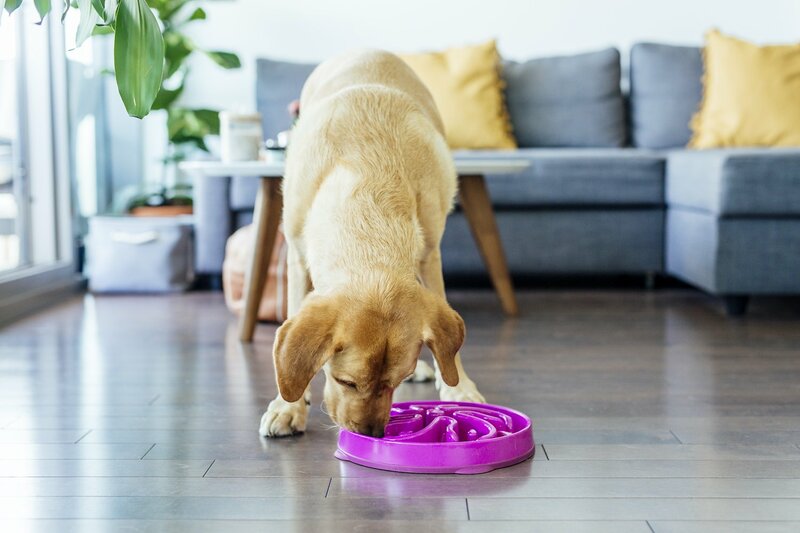 He usually finishes his meal and then prowls around our Vizsla mix who eats exactly one kibble at a time after thoroughly sniffing the entire bowl to see which piece is worthy of being the first. I digress. This sweet interactive feeder arrived in their box yesterday, and I am thoroughly entertained. Percy (the aforementioned beagle) was forced to eat a single kibble at a time and he had to use his beagle problem solving skills. 10/10 would buy again. I have a Mini Doxie that is on the chubby side and gulps her food down so quickly then goes to my Min Pin's dish to claim what she hasn't eaten yet. I don't have to lock the little one in anymore, it takes my chubby one at least 2-5 minutes to eat her food now and she doesn't seem hungry anymore and doesn't belch when she is done from swollowing all the air as she gobbles. I highly recommend.